As you’ve probably figured out, being a professional photographer requires more than excellent photography skills. As a business owner, you also have to understand how to attract the right clients and keep them – once you determine your niche. 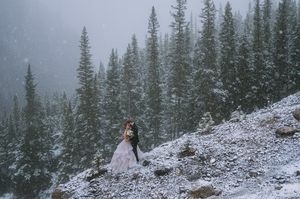 In this article on Professional Photographer, Darren Roberts explains how he went from photographing 20 city weddings a year to more than 50 mountain weddings in 2016. Being an outdoorsman who enjoys year-round camping, hiking, and just about everything else that involves being outside, Roberts knew that if he was to be truly successful, he needed to focus on what he loved. So he combined this passion with his desire to be a wedding photographer and became a mountain wedding photographer - specializing in unique, adventure-themed weddings. Roberts discusses the four steps he took to attract the perfect clients and reach his business goals. Read the full article, "Weddings With a Rocky View," on Professional Photographer. If you’re not already a PPA member, don’t forget to join PPA to get the latest advice and news in the photography world!